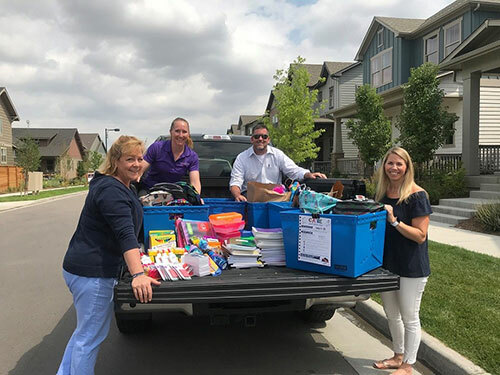 Denver, CO (August 15, 2018): David Weekley Homes, the nation’s largest privately-held builder, hosted its fourth annual, companywide CA+RE School Supplies Drive in 17 cities across the country. In Denver, school supplies were collected for MEED (Minority Enterprise & Educational Development), a nonprofit organization that strives to aid minority communities by providing educational opportunities and school supplies to students in need in Denver Public Schools. “Because of the generosity of David Weekley Homes, we are able to give children a strong start to the school year, to give them the same advantage as their peers to receive a quality education despite their financial situation,” said Sara Fuentes, executive director of MEED. Approximately $2,000 in supplies were collected from homeowners, vendors and David Weekley team members during the drive. This donation provided more than 500 students with the supplies needed for the school year. David Weekley Team Members donated school supplies to MEED (Minority Enterprise & Educational Development).